Life takes all sorts of people. Otherwise, our everyday human interaction would have no meaning, no real importance. But when each person brings something different to the table, that’s when life gets interesting. We need the introverts, the extroverts, and every shade in between. 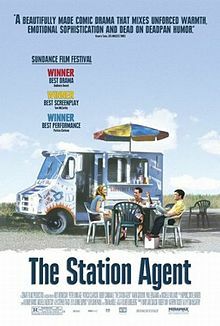 That’s really what The Station Agent is about. It’s made up of a ragtag cross-section of humanity. Each one’s a different puzzle piece and you wonder how they ever got together. But they all get thrown into one box in the sleepy town of Newfoundland, New Jersey, and these people wind up living life together. Maybe it sounds rather banal, but the result is actually quite rewarding. I don’t exactly find trains exhilarating, but if you have somebody to share them with they’re not so bad. The central character in our film is a train aficionado and reserved man named Finbar (Peter Dinklage). He’s been gifted a ramshackle shack bequeathed to him by the elderly proprietor of the hobby shop he used to work at. They both shared a contentment in silence and a deep affection for trains. Fin has seemingly lost his only friend in the world, and he resigns himself to silence because he assumes that all people ever notice about him is his size. They don’t seem to care about the person inside the body and he doesn’t want to take a chance. But that’s before he meets the genial dynamo Joe (Bobby Cannavale), who runs a coffee cart out in the boonies. It’s absolute torture for such a vibrant personality, and he jumps at the chance to have someone to talk to nearby. The quiet little man constantly deflects any attempt by Joe to become acquainted and yet it never fazes him. First reluctantly and then wholeheartedly Fin allows Joe on his long walks along the train tracks, and Joe breaks down the barriers. The unlikely pair gets even more unusual when they add middle-aged artist Olivia (Patricia Clarkson) into their ranks after she nearly runs over Fin several times. Like her two new acquaintances, she has personal issues to work through on her own. But that doesn’t mean she has to live life alone, and with Joe being the glue, these three have something going that truly blossoms into friendship. Two of the other pieces of the puzzle include the inquisitive girl Cleo, who shares Fin’s fascination with trains and builds an instant connection with him as children often can with other people. She’s direct, innocent, and she accepts Fin for who he is. Then there’s Emily (an almost unrecognizable Michelle Williams), the local librarian, who adds another layer to the town’s charm. She is pretty, but also very sweet and open to talking with Fin. Really she’s just looking for someone to listen since she’s going through a pregnancy with a boyfriend who is bad news. It’s easy to respect The Station Agent because it’s not a story where romance heals all wounds. There are two such moments when the film could have easily become that, but Tom McCarthy has a greater respect for his characters than that. They don’t get caught up in needless romantic entanglements for the sake of drama. Their interactions are more nuanced and sensitive than that. Because Joe might make jokes, but behind that veneer is a deeply caring heart. Noticeably McCarthy also has a great respect for quiet. His film is full of solitude as much as it is full of human interaction. That might be off-putting to some, but it makes the story all the more powerful, juxtaposing the idle chatter with tranquility. On his part, Peter Dinklage gives a breakout performance as a man who realizes he can let people into his life. Because in life true friendship can form between people of all colors, shapes, and sizes. We have to give out a chuckle when this unlikely trio is sitting on the porch talking about Fin’s love life one last time. Not in a million years would we expect to be sitting there with them enjoying the moment. But it happened and we do. In many ways, it’s a lot like life. This entry was posted in 2000s, Comedy, Drama and tagged Buddy, Indie Film, Review, Tom McCarthy by 4StarFilmFan. Bookmark the permalink.